Let op! Het label kan afwijken op de foto. Chemical Guys Sticky Citrus Wheel Cleaner Gel is a powerful, all-natural, and versatile wheel cleaner. Sticky Citrus Gel clings to wheels and rims, lifts and separates brake dust, road grime, dirt, and filth, then rinses easily for a perfectly clean wheel. Use Sticky Citrus Wheel Cleaner Gel on painted, polished, powder coated, chromed, wrapped, aluminum, steel, or carbon fiber wheels, rims, tires, suspension parts, and brake components. Sticky Citrus Wheel Cleaner Gel sticks hard to keep the cleaning power where you need it. The sprayable wheel cleaner uses advanced citrus cleaners and oxygen suspension technology to foam up and remove stuck-on contaminants with minimal agitation. Spray on Sticky Citrus Gel and agitate with a horsehair wheel brush to easily lift, separate, and remove heavy brake dust in seconds. Sticky Citrus Wheel Cleaning Gel is tough on dirt, yet gentle on wheels and rims. Sticky Citrus Wheel Cleaning Gel works on all OEM and aftermarket wheels and rims. The all natural wheel cleaning gel is easy to use, safe for the environment, and cleans thoroughly for immaculate results. Sticky Citrus Wheel Cleaner Gel is the easiest way to safely clean any wheel for a brilliant shine. The all new ready to use Sticky Citrus Wheel Cleaner Gel is the sticky clingy wheel cleaner. Sticky Citrus Gel is formulated with natural citrus extracts free of caustic cleaners, which makes it safe for all wheel and rim types. Sticky Citrus Gel is ideal for cleaning all wheels and rims effortlessly and safely. The thicker viscosity solution clings to wheels and vertical surfaces, suspending road grime, brake dust, oil, and dirt off the wheel safely and gently. The sprayable wheel cleaner grabs on to brake dust to gently clean the wheel and maintain the finish. Sticky Citrus Wheel Cleaning Gel is powerful enough to remove embedded brake dust, yet gentle enough for the most delicate wheels and rims. The advanced cleaning formula of Sticky Citrus Wheel Cleaner Gel uses the natural power of citrus to break down and remove stubborn brake dust, dirt, and grime for the best results. 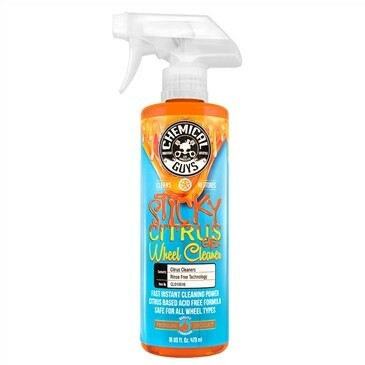 Chemical Guys Sticky Citrus Wheel Cleaner Gel is the all-natural solution that cleans and degreases nasty wheels fast. Customers and clients requested a product that would remove stubborn brake dust with minimal scrubbing countless times. Working off of nearly 10 years of experience with Sticky Citrus Gel, we have perfected the formula to deliver an acid-free wheel cleaner that achieves impeccable results on all wheel types. Sticky Citrus Wheel Cleaner Gel is approved for all OEM and aftermarket wheels and rims to easily remove stubborn brake dust in seconds. Works great on chrome, painted, polished, aluminum, powder coated, anodized, and custom wheel finishes. The citrus cleaning power breaks down heavy brake dust, dirt, grime, and filth to restore the brilliant shine back to your wheels and rims. The natural formula dissolves and emulsifies filth and contaminants before they get a chance to burn into your wheels. 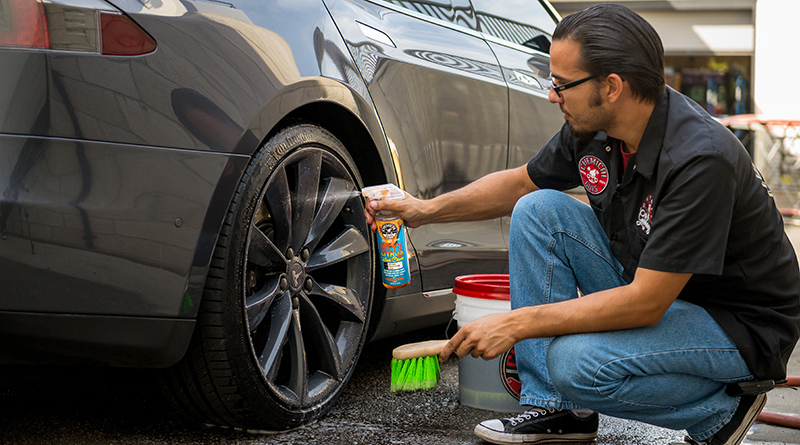 Using Sticky Citrus Wheel Cleaner Gel as a part of your wheel cleaning regimen will help keep your rims pristine. To use, simply spray on a dirty wheel, let sit, then rinse away along with any loosened contaminants. For exceptionally-dirty areas, re-spray and agitate with a brush before rinsing. Chemical Guys Sticky Citrus Wheel Cleaner Gel delivers professional results. Dirt, brake dust, and debris simply rinse away after just a few sprays! The natural cleansers and degreasers pull off all the nastiness of the road in the safest way possible, leaving behind shiny rims and a fresh citrus scent. The amazing cleaning power easily cleans between spokes and lug nuts for a complete and thorough wheel cleaning service. Sticky Citrus Wheel Cleaning Gel cleans even the most neglected wheels and rims. The amazing cleaning power is perfect for cleaning any wheel of any size. Spray inside the wheel barrel for a deep cleaning you can see through the spokes. The non-caustic formula rinses clean with no spots and no residue. Upgrade your wheel cleaner to the best natural option: Chemical Guys Sticky Citrus Wheel Cleaner Gel. Your voice is heard. 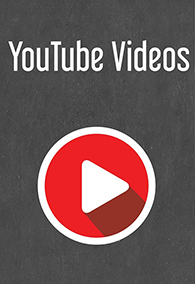 Growing is what we do and growth relies on innovation and education. For the past 10 years we’ve taken notes and listened to your feedback on how we can make Chemical Guys products even better. Our products have traveled around the world and have been used on millions of vehicles, and we’re proud to say that the results were exceptional. Improving an already-amazing product involves reengineering, redeveloping, and manufacturing a product that exceeds even our own expectations. Utilizing the most innovative equipment and latest chemistry, we completely reinvented Sticky Citrus Wheel Cleaner Gel as the ultimate acid-free eco-friendly wheel cleaner and degreaser. We've improved the looks: We’ve boosted Sticky Citrus Gel with more citrus extracts and special clinging agents for faster, stronger, and better cleaning power for amazing cleaning results! We've improved the safety: We’ve formulated Sticky Citrus Wheel Cleaner Gel with all-natural citrus extracts, and without highly-caustic cleaners. Caustic cleaners and acids are bad for the environment, and your own health. Sticky Citrus Gel combines natural cleaners with oxygen generators to clean any wheel type safely and effectively, without any harm to you or the environment. We’ve made it stickier: Gels make good cleaners because they don’t roll off the surface before they can do any work. Blending extra emulsifiers and citrus cleansers helps the sticky gel cling to vertical surfaces for longer. Spray Sticky Citrus Wheel Gel over filthy wheel parts, and watch it stay where it is needed most for faster cleaning with less product. Rinse wheels with sharp stream of water to remove loose dirt and soften tough grime. Spray Sticky Citrus Wheel Cleaner Gel on wheels, tires, wheel wells, brakes parts, and suspension components. If heavy brake dust removal is required, allow Sticky Citrus Wheel Cleaner Gel to dwell for several minutes and agitate with a soft wheel-cleaning brush. For best results, agitate Sticky Citrus Gel with any of the premium wheel-cleaning brushes from the full Chemical Guys lineup of brushes and accessories. Rinse all the Sticky Citrus Wheel Cleaner Gel and filthy grime from wheels and tires using a sharp stream of water. Dry wheels to a perfect finish with a clean Microfiber towel. 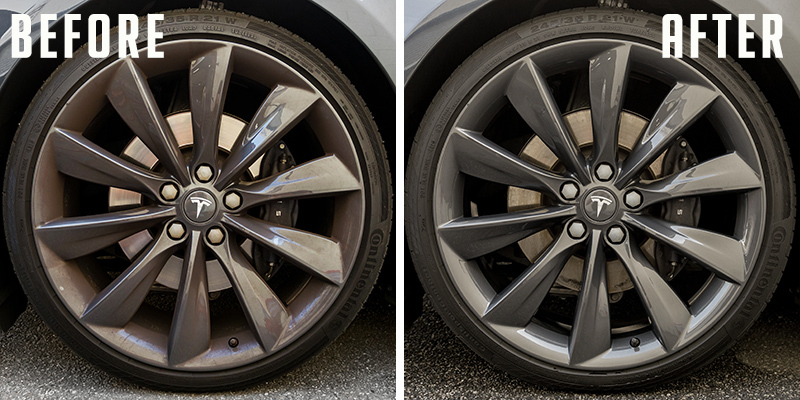 Apply Chemical Guys Wheel Guard to protect wheels from brake dust.